It's Karen from The Bald Dragonfly here! I'm delighted to be back with my final card for Newton's Nook Designs as their October Guest Designer. 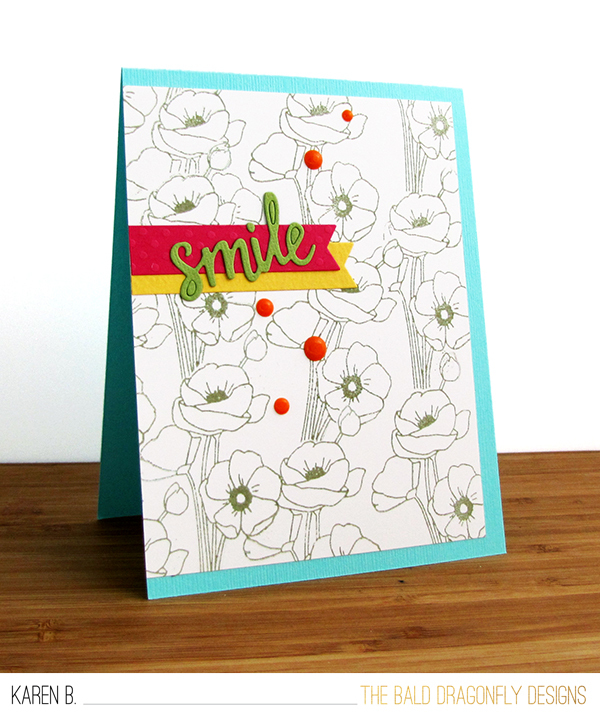 I decided to create a bright, cheery card using the Flower Garden Stamp Set and the Garden Window Die Set. I started by stamping the poppy image from the Flower Garden Stamp Set in gray ink repeatedly onto white cardstock. I them mounted the panel onto an aqua panel, opting to leave an unconventional border on just three sides. I then die cut the word "smile" and a rose and yellow banner from the Garden Window Die Set and adhered these over the poppies. To finish off the card, I added a sprinkling of bright orange Nuvo Drops. 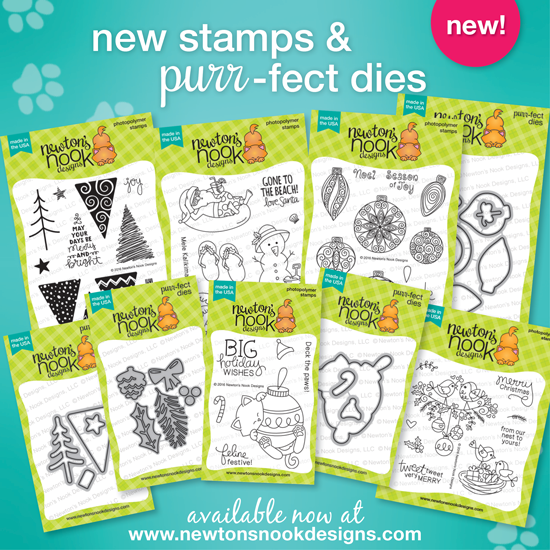 It was such a pleasure to guest design for Newton's Nook Designs and work with their amazing products! Thank you for having me! This week was the Cat Lovers Hop! I really wanted to post a card earlier but it's been a bit crazy here with our NEW holiday release this week! So I'm sneaking one in late today! There's still one more day to play along! 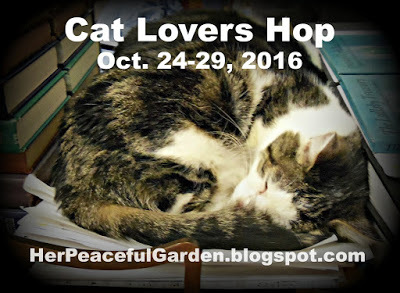 To participate in this blog hop, you just have to create a project that features a cat and upload it to the post on Her Peaceful Garden! You totally should play along if you can since there are some really awesome sponsors and prizes, including one from us at Newton's Nook Designs! I don't know about you but this time of year feels like the perfect time to curl up and read! So I pulled out my Newton's Book Club stamp set to create this fun card. It's hard to choose my favorite image from this set but I settled on the cute kitty reading a book! I love those glasses! I stamped him onto watercolor paper with waterproof ink and colored him with inktense colored pencils and a waterbrush. I added the "Curl up with a good book" sentiment above him, also from the Newton's Book Club stamp set and then started on the card base. I decided to use a fun teal and orange combo for colors and used a teal card base, adding a layer of plaid pattern paper and some polka dot papers too. Then I added strip of teal chevron washi tape and some fun colored dots. When I added the image to the card the square seemed too "square" so I used a corner rounder on two corners to give it a little more interest! This card would be perfect for our current inky paws challenge too! 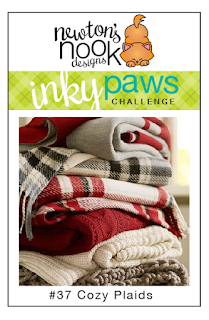 The theme is Cozy Plaids and it's open until Next Friday, Nov. 4 if you want to play along! You can find details here! Meanwhile, I hope you will play along with the Cat Lovers Hop! I know Newton, our sweet kitty, definitely approves of this hop!! 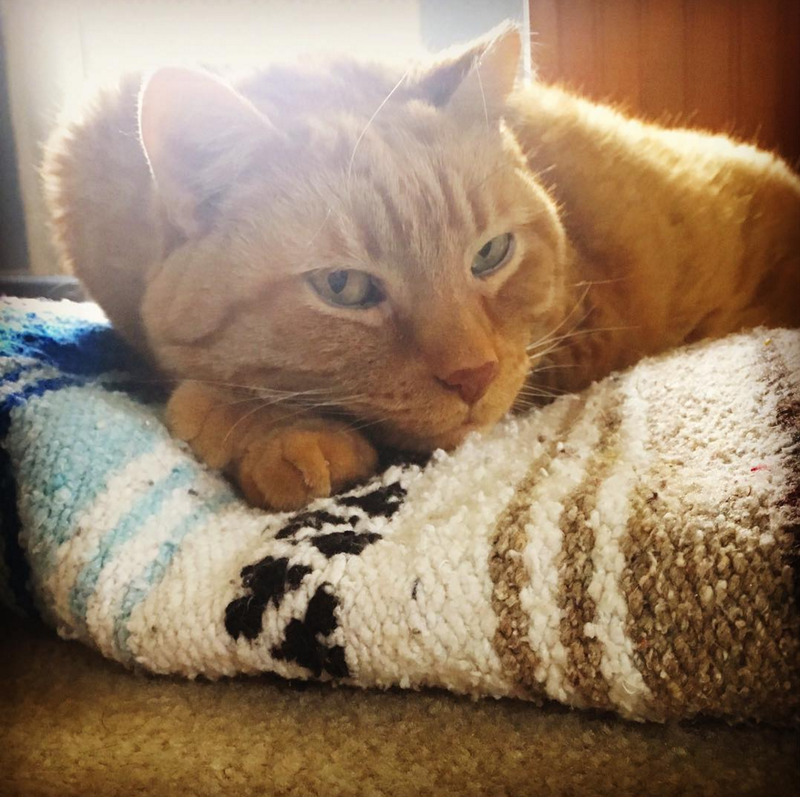 Have you met Newton yet? If you haven't, here's a quick pic of him! He's the inspiration for many of our cat themed stamps and the namesake of our company! You have until Oct 29th to link up at Her Peaceful Garden for a chance to win prizes! 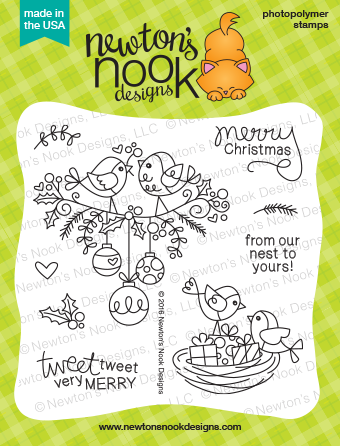 with our Newton's Curious Christmas stamp set! This coordinates with our Newton's Curious Christmas stamp set. Thank you to everyone for participating in our blog hop. We really enjoy reading all of your comments! Check out below to see if you won! The the blogs and the comments were chosen using randomnumbergenerator.com. Congrats to the Winners! Don't forget - you have 5 days from today to to e-mail us at info@newtonsnookdesigns.com with your full name and shipping address to claim your prize. Are you enjoying our new Holiday stamps? 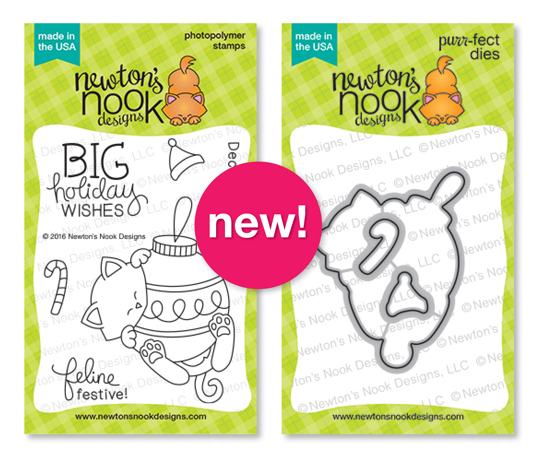 Today we're sharing a new mini Newton set, Ornamental Newton and a the fun new 4x6 Festive Forest stamp set! Both of these sets today also have coordinating dies! We are giving two stamps set away today so make sure you read all the way to the bottom of this post to see how to win! "Deck the Paws" with this delightful 3 x 4 mini set! In this set our favorite feline, Newton, is helping to decorate for the holidays with the biggest ornament he could find! Send BIG holiday wishes to friends and family with this amusing image. This set includes several fun sentiments include help you customize your greeting too! 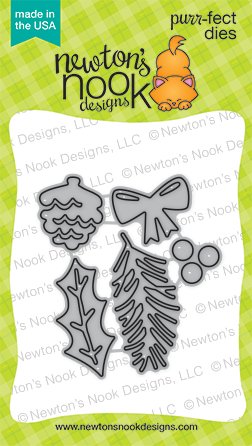 Create a forest of fabulous patterned trees with this 4 x 6 stamp set! These decorative trees are so fun and easy to use. Just grab your favorite colored inks and stamp away. Mix and match them with the two tree trunks and two star toppers! 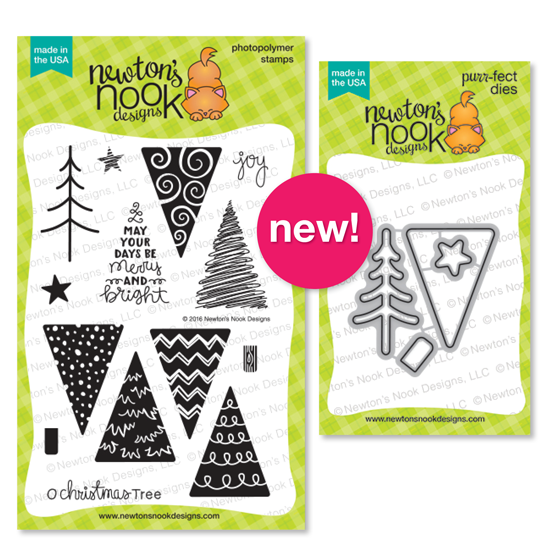 The playful patterned trees will make fantastic holiday cards and more! This set also has a fun coordinating die! Get in the Holiday mood with these adorable projects by our Design Team! Stephanie did some super cute paper piercing on the big christmas ornament for her card! I love her use of pattern papers too! 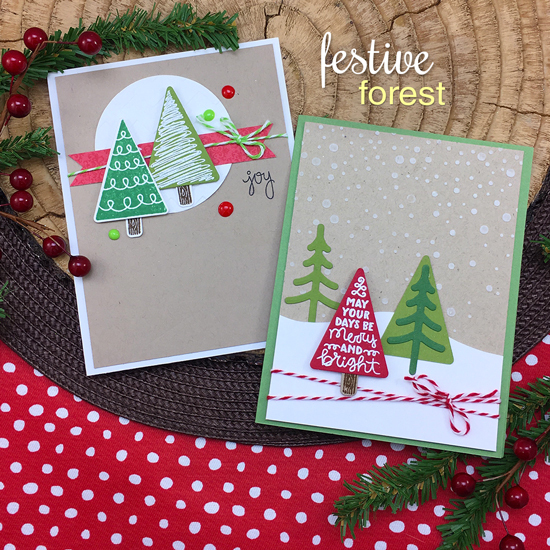 This clean and simple card by Samantha using the Festive Forest set is so pretty! 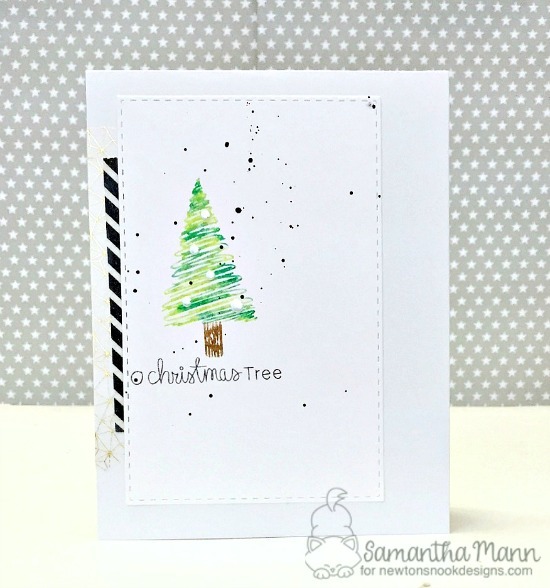 I love how she used multiple shades of green on the tree stamp! 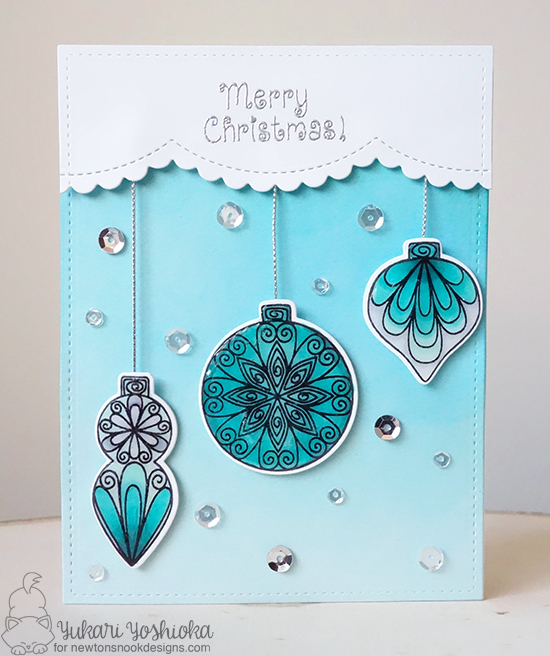 Yukari created this sweet ornament card using gogeous shades of blue! I love how the kitty looks like he's hanging in a frame! 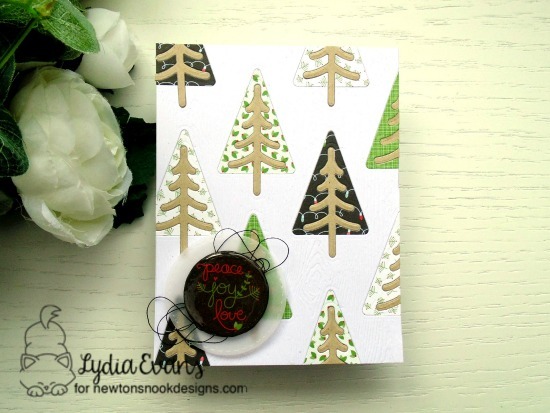 Lydia created this lovely forest of trees using just the Festive Forest Die Set! This set works great with or without the stamps too! 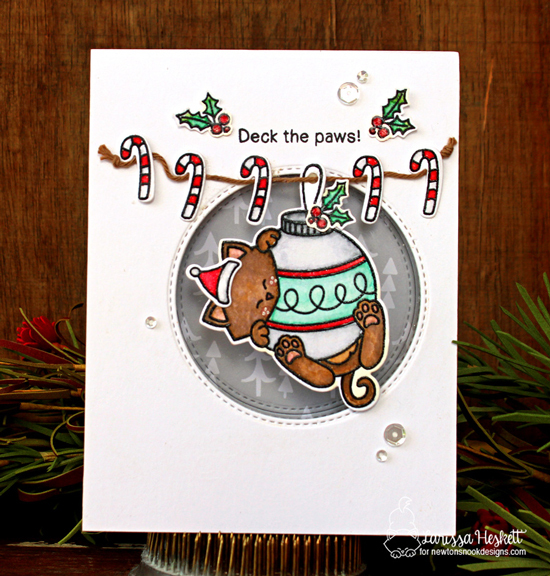 Jess created this adorable kitty card using traditional red and green! She used the "Deck the Paws" sentiment repeatedly across the banner and then added bits of gold glitter ot the ornament! 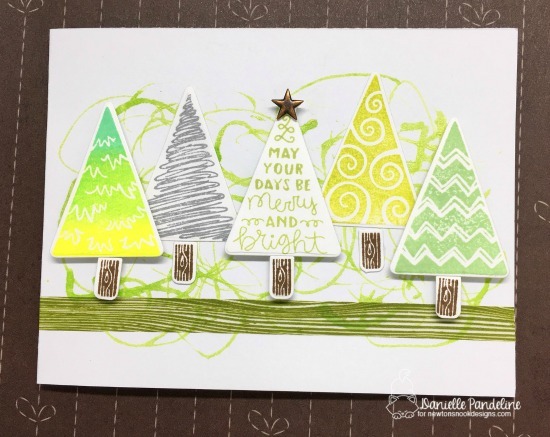 Danielle created a whole forest of trees in shades of green using Festive Forest Stamps and coordinating dies. The gold star on the center tree is so pretty! Larissa created this lovely card using the kitty from the Ornamental Newton set. Doesn't he look so cute in his added Santa Hat? She also added a whole line of candy canes too! So adorable! 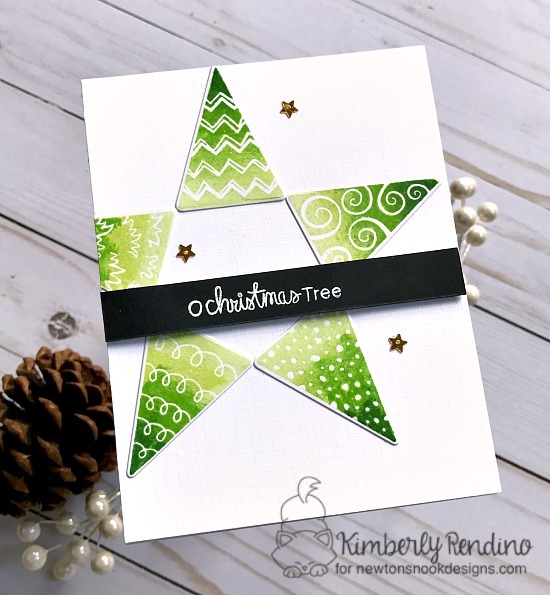 Kimberly stamped several of the fun patterned trees from the Festive Forest set and used them to create a star! What fun idea. The ombré inks look gorgeous on these trees too! 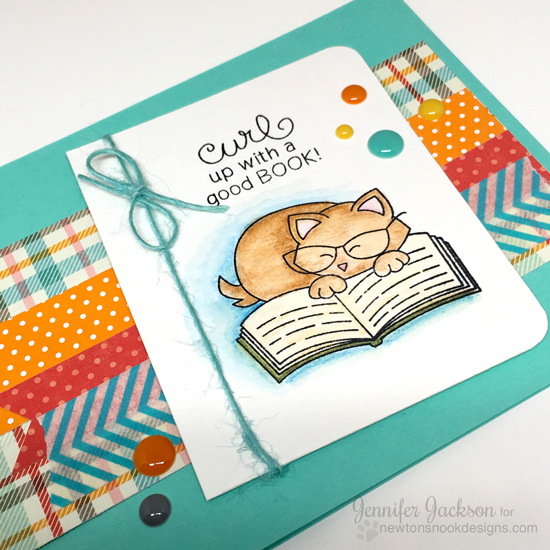 Naki created this sweet kitty card using the Ornamental Newton stamp set and coordinating die set. She also added in some fun white branches using our Pines & Holly die set (revealed here on Tuesday). 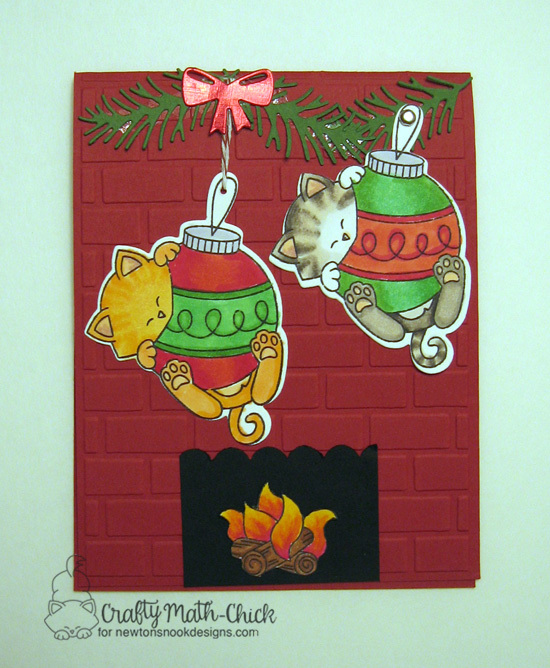 Crafty Math-Chick created this awesome scene with two kittings haning out over the fireplace! They look just like Newton and Hobbes!! She also added in some fun white branches using our Pines & Holly die set (revealed here on Tuesday) and the fire from our Campfire Tails Stamp set! 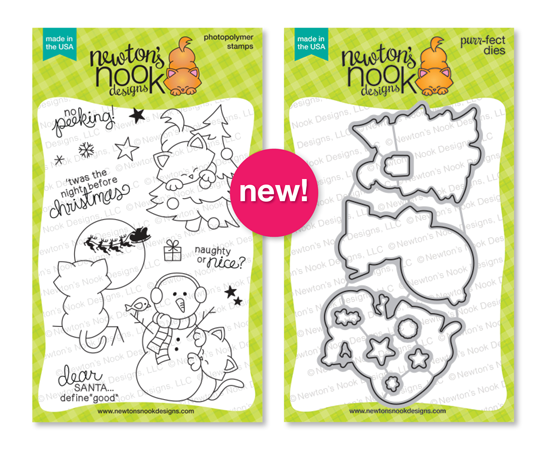 Would you like to win the “Ornamental Newton” or the "Festive Forest"Stamp Set? Today we will pick two winners, one to win each set! Comment on the NND blog and Design Team blogs (see list below)! The winner will be chosen at random from the collective blog release posts. Make sure to check out each of their blogs and comment for your chance to win. You will not know which blog has been chosen so the more you comment on the better your chances are of winning! You have until Thursday, October 27th at 9pm CST to comment -- winners will be announced on the blog post on Friday, October 28th. Today we have another reveal from our Holiday Release! 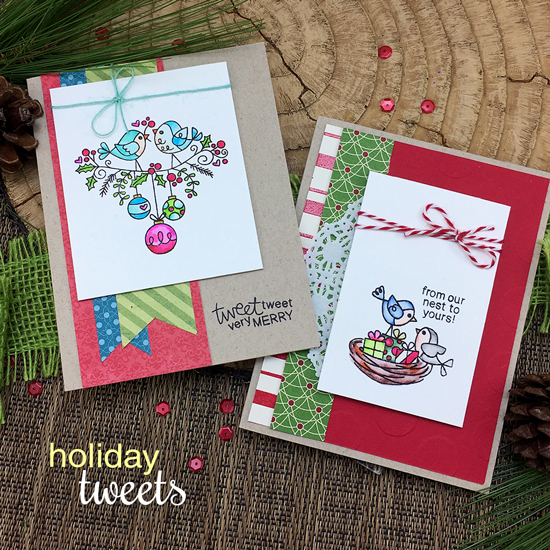 We are featuring the sweet little Holiday Tweets stamp set! We are giving this stamp set away one lucky winner so make sure you read all the way to the bottom of this post to see how to win! This 4 x 4 mini set is packed with Christmas cheer! 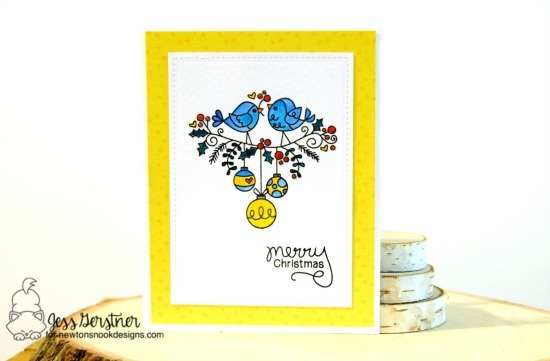 This charming set features little bird couples sharing holiday wishes! The bird couple on the branch will be so fun to color in different holiday themes! The image of the birds with a nest full of gifts could also be used for house-warming and birthday cards! Add in the "from our nest to yours" sentiment to complete the fun! Get ready for sweet Tweets with inspiration from our Design Team! Stephanie did some lovely watercoloring on the sweet bird image! 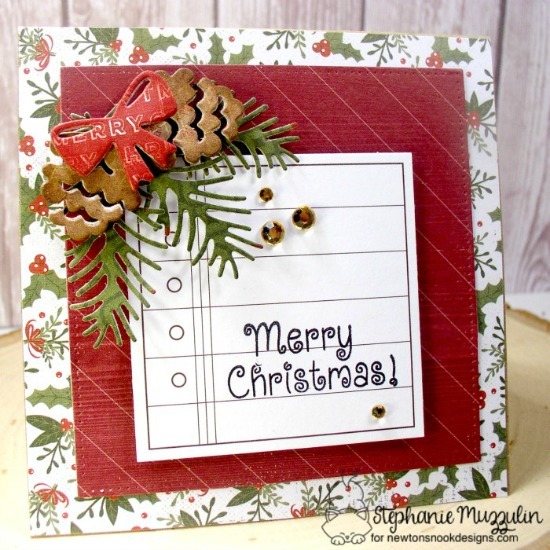 The "Merry Christmas" sentiment stamped on the woodgrain banner adds the perfect woodsy feel to her card! 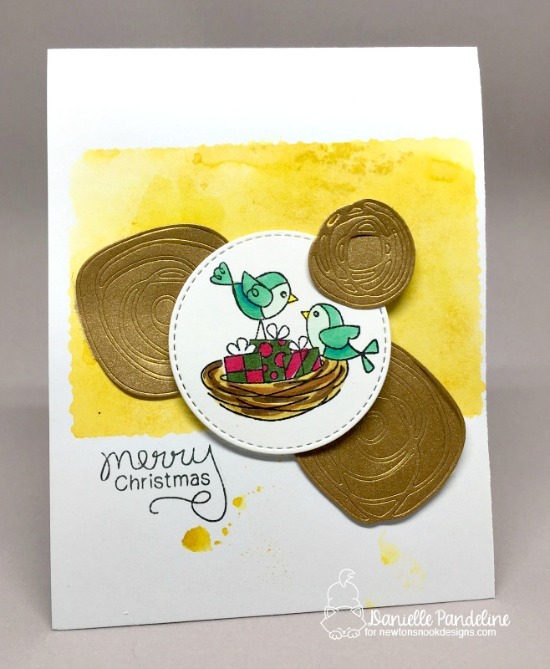 This fun card by Naki uses the little birdie couple in their nest. She also masked the ornament from the larger stamp and added it on, hanging it all from a branch she die cut from our What a Hoot die set! She also added in a bow from the new Pines & Holly die set! What a fun combo of products! 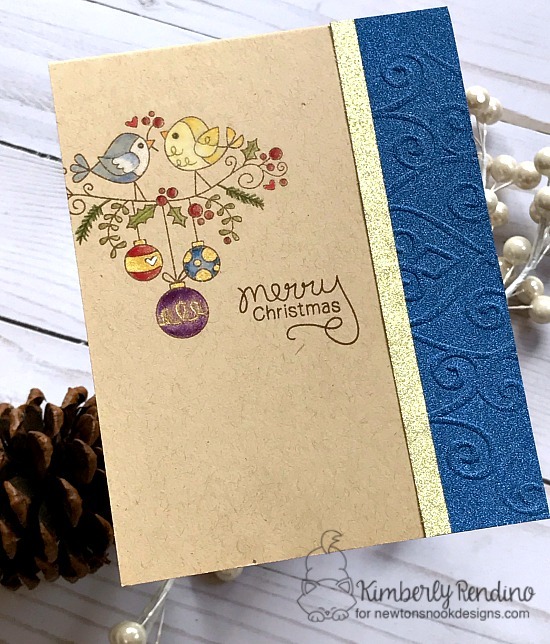 Kimberly stamped and colored the bird image onto Kraft paper! I love the look of the kraft paired with the glittery gold and blue border! Lydia did some sweet coloring of those birdies in tones of brown, red and gold! The gold strip up the side gives this clean and simple card the perfect touch of sparkle! fun gold swirls! 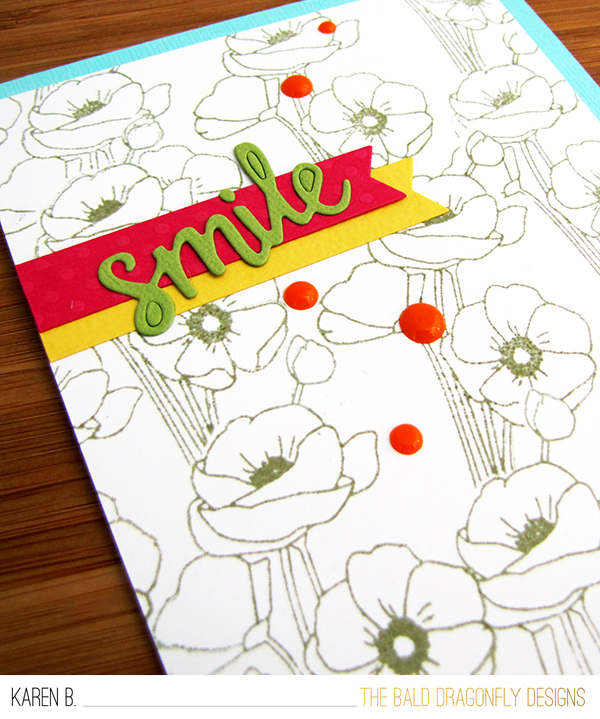 The bright yellow inked background gives the card such a cheery feel! Yukari created this sweet simple card using the birds on the branch as the focus and coloring them in tones of blues! I love the blue polka dot border and scalloped edges too! This sweet watercolored card is by Samantha! I love how she added a soft watercolored blue background and added bits of white over the top like falling snow! Jess created a cheerful holiday card using traditional holiday colors with the addition of bright yellow! What a fun way to brighten up the holidays! 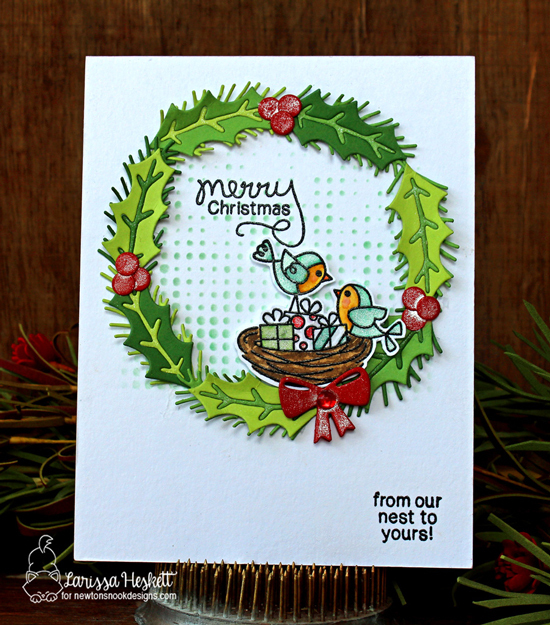 This beautiful wreath card by Larissa is so fun and festive! She added the birds in the nest to a wreath that she created using the Pines & Holly die set (revealed yesterday). I love this idea! So gorgeous! 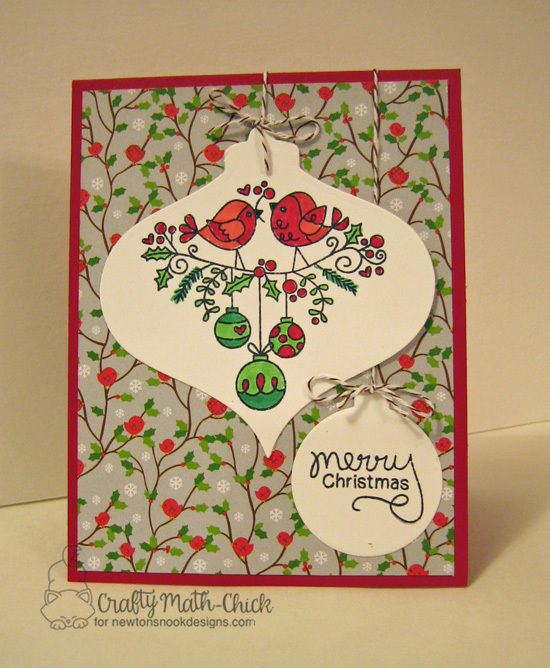 This darling card by Crafty Math-Chick features those sweet birdies and the "merry Christmas" inside an ornaments! What a fun idea! I love the fun little birdies on the background paper too! Would you like to win the “Holiday Tweets” Stamp Set? Today is our second reveal day for our October Release! This month we are releasing awesome new Holiday designs and today we are sharing our new Beautiful Baubles stamp set & coordinating die and our Pines & Holly die set! We are giving the Beautiful Baubles stamp set away one lucky winner so make sure you read all the way to the bottom of this post to see how to win! This 4 x 6 set is filled with stunning ornament designs that will create gorgeous holiday cards! 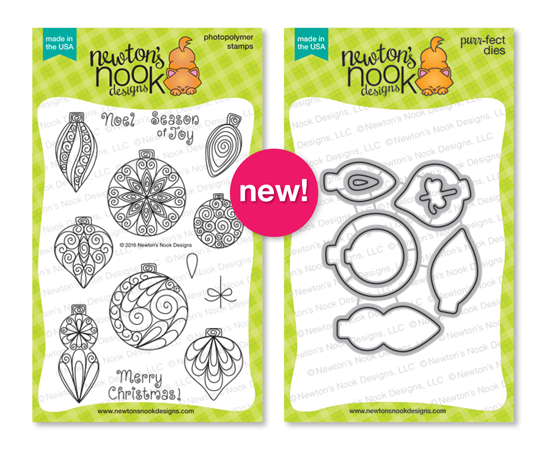 Inspired by paper Quilling, these ornaments are filled with delicate swirly decorations that will be delightful to stamp or emboss! Stamp the bow or hanger above the top to "hang" them onto your project. There is even a Christmas lightbulb that is perfect for creating strings of lights! This set has a coordinating die set too! Get ready for some lovely ornament inspiration from our Design Team! 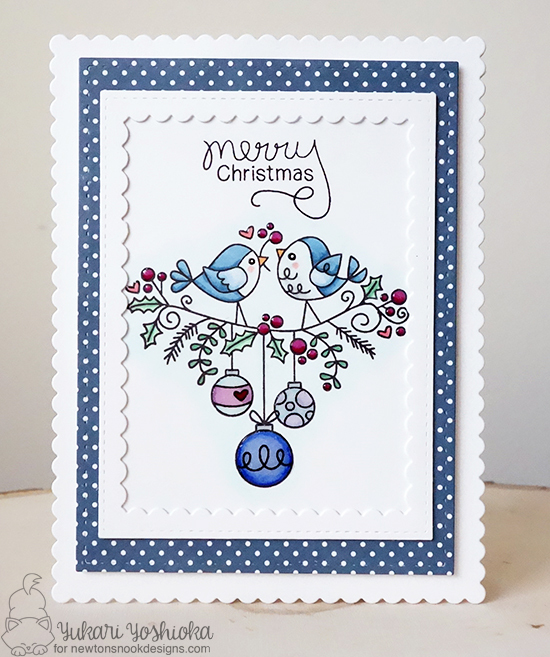 Samantha created this lovely card using the ornaments from the Beautiful Baubles stamp set. I love the tone-on ones in the background too! 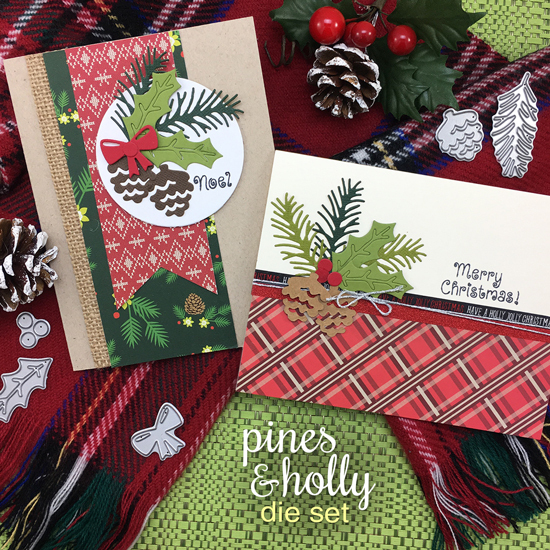 Stephanie created this gorgeous little square card using the pine branches, pinecones and bow from the the new Pines & Holly die set. 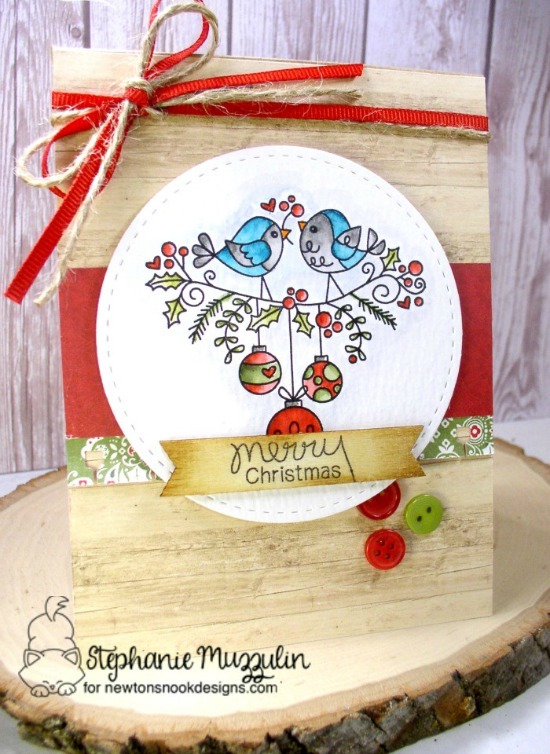 The "Merry Christmas" sentiment is from the Beautiful Baubles stamp set. This beautiful teal and silver christmas card was created by Yukari. 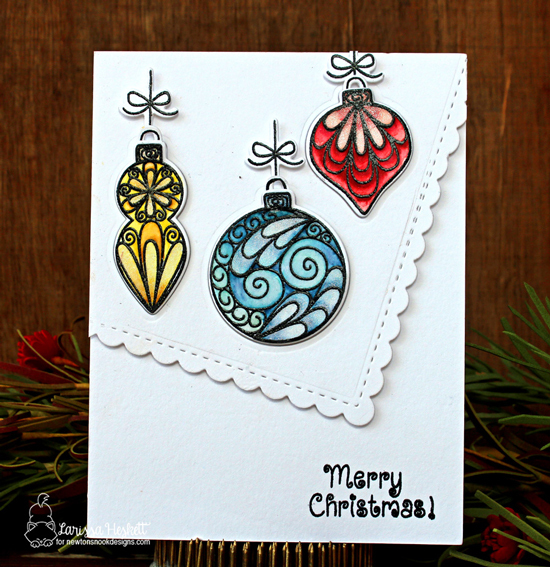 She used the new Beautiful Baubles stamp set + coordinating die set to create the beautiful hanging ornaments! 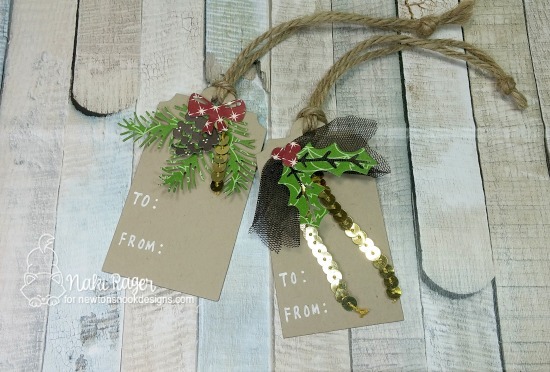 Naki created this adodrable duo of tags using the fun foilage from the new Pines & Holly die set. Isn't it fun how she cut them out of patterned papers? Kimberly used both of the die sets featured today to create this card. 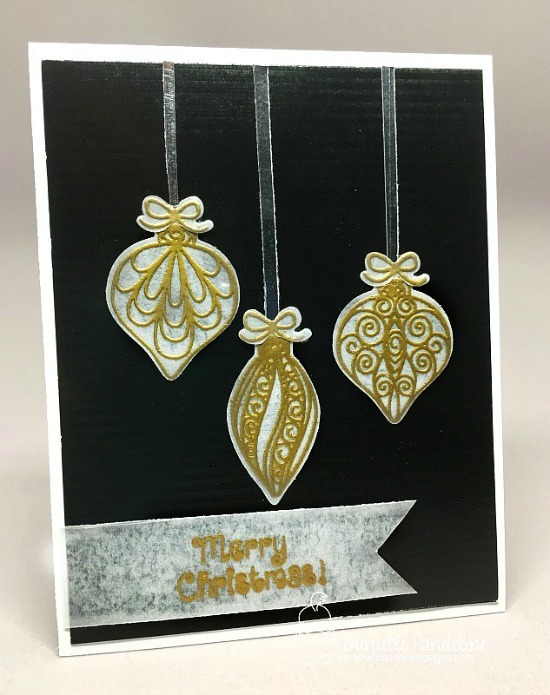 The ornament was trimmed out of gold using the Beautiful Baubles die set and the branches and bow are from the Pines & Holly die set. She added in the "Noel" sentiment from the Beautiful Baubles stamp set too! 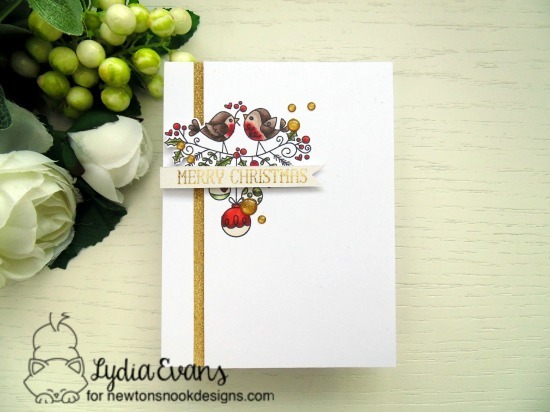 Lydia created this beautiful card using elements from the new Pines & Holly die set. See how the center of the holly leaf can double as a twig? So fun! Danielle created this classy gold and black card using the ornamentas from the Beautiful Baubles stamp set and trimed them out with the coordinating die set. So lovely and elegant! Jess created a wreath using the pine branches, pinecones and bow from the Pines & Holly die set! These dies are so fun and vesatile! She also added in a sneak peek with a sentiment from a set we are revealing later this week! 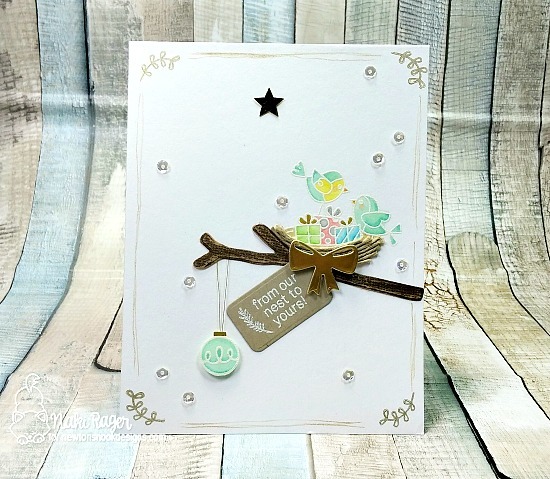 Larissa created this beautiful card using the Beautiful Baubles stamp set and coordinating die set. I love the beautiful way she colored the ornaments - they look like they are glowing! Would you like to win the “Beautiful Baubles” Stamp Set?